They’re BAAAAAAAACK! Or will be soon! Meee-ow! Helping to perk up the lax summer theatre season. And since everything in the world is going digital, they’re going to have a digital lottery! Read on! New York, NY – Producers The Shubert Organization and The Nederlander Organization announced today the launch of an online ticket lottery for the first-ever Broadway revival of Andrew Lloyd Webber’s iconic musical, CATS. The CATS Digital Lottery will open daily at 10:00 a.m. EST and 8:30 a.m. for matinee performances, beginning Thursday, July 14, 2016, for entrants to win a limited number of $40 same day tickets to that day’s performance(s) by clicking here. See below for rules and regulations. The CATS digital lottery is powered by Broadway Direct. One of the biggest hits in theatrical history, CATS returns to Broadway at the Neil Simon Theatre (250 W 52nd Street) with preview performances beginning Thursday, July 14, 2016, and an official opening set for Sunday, July 31, 2016. A limited number of tickets for each performance will be sold via digital lottery. The CATS Digital Lottery will open at 10:00 am EST and will remain open until 3 pm EST for evening performances. For two-show days, the Lottery will open at 12 pm and close at 3 pm. For matinee performances, the Lottery will open at 8:30 am and close at 11 am. Winners will be notified by e-mail minutes after drawing and will have 60 minutes to pay for their tickets with a credit card online. They must present their photo ID at the Neil Simon Theatre box office at least 30 minutes prior to the start of the corresponding performance to pick up their tickets. Seat locations and number of tickets awarded by the lottery are subject to availability. 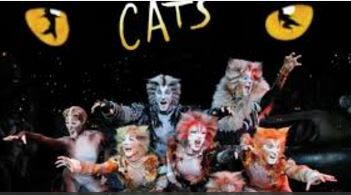 The new generation of CATS includes British Singing Sensation, Leona Lewis as “Grizabella,” Giuseppe Bausilio as “Carbucketty,”Quentin Earl Darrington as “Old Deuteronomy,” Jeremy Davis as “Skimbleshanks,” Kim Fauré as “Demeter,” Sara Jean Ford as “Jellylorum,” Lili Froehlich as “Electra,” Daniel Gaymon as “Macavity,” Shonica Gooden as “Rumpleteazer,” Christopher Gurr as “Gus/Bustopher Jones,” Tyler Hanes as “Rum Tum Tugger,” Andy Huntington Jones as “Munkustrap,” Kolton Krouse as “Tumblebrutus,” Eloise Kropp as “Jennyanydots / Gumbie,” Jess LeProtto as “Mungojerrie,” Georgina Pazcoguin as “Victoria,”Emily Pynenburg as “Cassandra,” Arianna Rosario as “Sillabub,” Ahmad Simmons as “Alonzo,” Christine Cornish Smith“Bombalurina,” Corey John Snide as “Coricopat,” Emily Tate as “Tantomile,” Ricky Ubeda as “Mistoffelees,” and Sharrod Williamsas “Pouncival,”as well as Richard Todd Adams, Aaron J. Albano, Callan Bergmann, Claire Camp, Francesca Granell, Jessica Hendy, Harris Milgrim, Madison Mitchell, Nathan Patrick Morgan and Megan Ort. The creative team for the new Broadway production of CATS includes John Napier (Scenic & Costume Design), Natasha Katz(Lighting Design), Mick Potter (Sound Design), based on the original choreography by Gillian Lynne, with additional choreography byAndy Blankenbuehler and direction by Trevor Nunn. When CATS opens, Andrew Lloyd Webber will, once again, have the rare distinction of having three musicals running simultaneously on Broadway: The Phantom of the Opera, School of Rock – The Musical, and CATS.